Pakistan 7-236 (Imran Farhat 93, Misbah-ul-Haq 80, Robin Peterson 2-46) beat South Africa 9-234 (AB de Villiers 75, David Miller 67, Saeed Ajmal 3-42) by three wickets. Misbah-ul-Haq and Imran Farhat sailed the ship of Pakistan towards a win as their bowlers restricted South Africa to a reasonable score while bowling first. 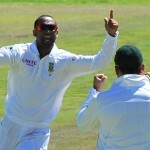 The Proteas scored 234 runs for the loss of nine wickets in the allocated 50 overs. The Green Shirts smashed 236 runs with three wickets in hand and 8 balls to spare. Misbah-ul-Haq (Pakistan) was declared ‘Player of the match’ for his brilliant knock of 80 runs and able captaincy. The fourth One Day International of the five match series was played on Thursday, March 21, 2013, at Kingsmead, Durban. Earlier, AB de Villiers, the captain of South Africa, won the toss and opted to bat first on a wicket that resembles to an Asian strip. The lanky fast bowler of Pakistan, Mohammad Irfan, provided them an ideal start as he got rid of the two top order batsmen of the home side. Hashim Amla was caught behind by the wicket keeper Kamran Akmal on the very first ball and the stumps of Colin Ingram who came next were uprooted on the following ball. AB de Villiers walked in next and hit a four on the last ball of the over followed by another two in the fourth over. Graeme Smith scored just three runs from the 15 balls he faced and hit the first four in the seventh over. Junaid Khan clean bowled Smith for 12 on the first delivery of the 10th over and got rid of Farhaan Behardien on the last ball for just one run. The hosts were reeling at 4-38 in 10 overs as David Miller associated with de Villiers and stopped the Irruption of the rival bowlers. The first was dropped at nine runs by Imran Farhat at short midwicket off Mohammad Hafeez and the batsman responded with a couple of fours in the succeeding overs. AB de Villiers kept on cruising from the other end and completed his 31st fifty in the 24th over. David Miller was playing well and was sending the loose ball out of the fence at regular intervals. He achieved his third ODI half century on the second ball of the 29th over with a four. The score was enhanced to 151 in 33 overs when Saeed Ajmal brought back the Green Shirts in the game by removing three batsmen. Miller was held leg before wicket for 67 off 77 with 7 fours, AB de Villiers was caught behind for 75 from 108 balls with 5 fours and Ryan McLaren lost his wicket for 11 runs. Robin Peterson remained unbeaten for 25 as the hosts reached 234 with one wicket in hand at the end of the 50th over. 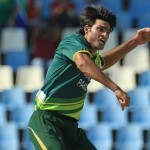 Mohammad Irfan, Junaid Khan and Saeed Ajmal were equally good bowlers and grasped three wicket each. Pakistan lost their first wicket at just two runs when Mohammad Hafeez was declared obstructing the field. Imran Farhat kept on securing his end as the tourists lost a couple of wickets from the other side. Kamran Akmal was gone for 11 and the experienced batsman, Younis Khan, scored just four runs and the Green Shirts were in trouble at 3-33 in 11 overs. Misbah-ul-Haq got together with Imran Farhat and they kept on moving the score board with odd boundaries. 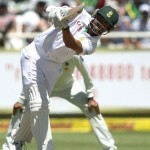 Imran Farhat was dropped at 26 by AB de Villiers behind the stumps off Robin Peterson on the last ball of the 22nd over. Misbah-ul-Haq changed his gears, he hit two fours in the coming overs and punished Colin Ingram for 16 runs with 2 big sixes and 1 four. He also attained his 22nd ODI fifty as his team went past the 100 runs mark in the same over as well. Imran Farhat joined the party by adding 9 runs in the 34th over with 2 fours and achieved his 13th ODI half century. They started playing their shots and the boundaries were being witnessed more often. The score was lifted to 186 in 41.1 overs when Misbah-ul-Haq lost his wicket for 80 off 93 deliveries with 2 huge sixes and 7 fours. Shahid Afridi went out cheaply for four runs and was replaced by Shoaib Malik as Pakistan required 44 runs to win the match in 48 balls. The batsmen were scoring ahead of the required run rate assisted by boundaries as Imran Farhat went into the nineties with a grand six in the 46th over. He was unluckily dismissed for 93 off 144 balls with 1 six and 8 fours. Shoaib Malik dispatched the winning four on the fourth ball of the 49th over, he was at the crease with 19 as the visitors rushed to 236. Robin Peterson was the top wicket taker with two whereas Dale Steyn, Lowabo Tsotsobe and Rory Kleinveldt shared one wicket each. Pakistan triumphed in the interesting encounter by a margin of three wickets and the five match series was levelled at 2-2. The fifth and final ODI will be played on March 24, 2013, at Willowmoore Park, Benoni.